We percutaneously put a pin across the fracture after closed reduction for 12-16 weeks. The last picture is a final after the fracture is healed and the pin is removed. 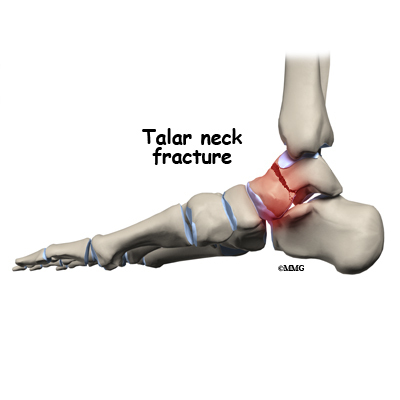 Talar neck fractures can be devastating injuries that can occur from forcing the foot up into the leg. It can occur in motor vehicle accidents when somebody pushes their foot down on a brake or pushes their foot down on the floorboard at impact. Injuries to the talar neck in pediatric patients are treated similar to the way they are in adults. All nondisplaced fractures can be treated conservatively with a cast below the knee. These must be treated nonweightbearing until the fracture has healed. Other fractures may be displaced, which also disrupt to the blood supply to the bone. Although these are uncommon, they may be devastating injuries to the bone and the joints around them. Fractures would need to be immediately reduced and fixed to avoid long-term problems. Even with the best procedures and fixation of these fractures, small areas of bone can still be devoid of blood supply, creating problems. Signs and symptoms of talar fractures include diffuse swelling and pain throughout the ankle and that portion of the foot. Difficulty moving the foot will be common. In severe cases the bone can actually pop through the skin and the joints can dislocate. X-rays are necessary to evaluate the fracture. In some cases CT scans may be needed to fully evaluate the injury and determine its approach and treatment. The long-term prognosis of talar fractures depends on the degree of injury to the bone and cartilage. Osteochondral fractures may be treated conservatively by placing the patient in a cast below the knee, avoiding weightbearing for at least eight weeks. This will be followed with a walking boot to maximize the healing process. If persistent pain is present, arthroscopic surgery may be necessary to debride the fracture fragments and micro fracture the joint surface to help develop fiber cartilage. This would resurface the bone with cartilage that is not as durable as real cartilage that we are born with. However, it does help to minimize the problem. Talar neck fractures that are nondisplaced will generally go on to uneventful healing. The prognosis for fractures that involve the neck of the talus and affect the blood supply to the area may be very poor. Small avulsion fractures that are treated have an excellent long-term prognosis and will allow the child or teenager to return to all sports and activities without any long-term problems.